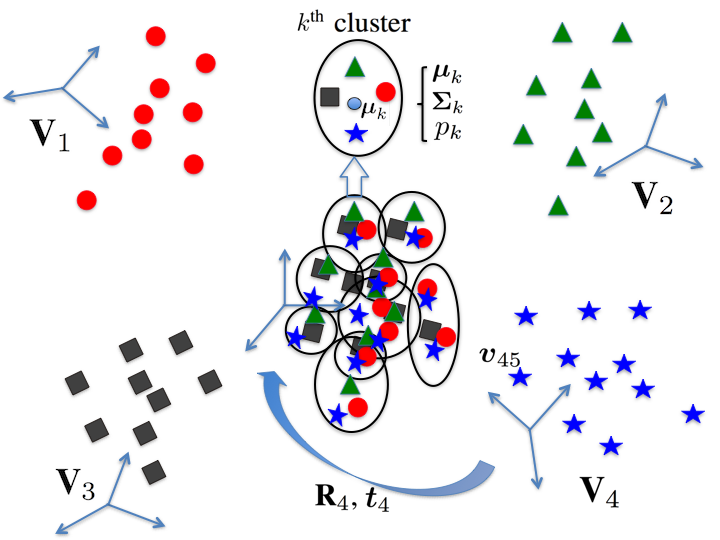 Abstract : This paper addresses the problem of registering multiple point sets. Solutions to this problem are often approximated by repeatedly solving for pairwise registration, which results in an uneven treatment of the sets forming a pair: a model set and a data set. The main drawback of this strategy is that the model set may contain noise and outliers, which negatively affects the estimation of the registration parameters. In contrast, the proposed formulation treats all the point sets on an equal footing. Indeed, all the points are drawn from a central Gaussian mixture, hence the registration is cast into a clustering problem. We formally derive batch and incremental EM algorithms that robustly estimate both the GMM parameters and the rotations and translations that optimally align the sets. Moreover, the mixture's means play the role of the registered set of points while the variances provide rich information about the contribution of each component to the alignment. We thoroughly test the proposed algorithms on simulated data and on challenging real data collected with range sensors. We compare them with several state-of-the-art algorithms, and we show their potential for surface reconstruction from depth data.